I finally got the Highland Triangle Shawl blocked. Isn't it amazing what blocking can do for wool? The points are pointy, the holes are open, and the whole thing is bigger. The drape is so much better. Yippee. She's stretched out above on our newly exposed wood floor. The flash makes the color wrong -- it is actually a darker blue, and the floor is actually a little more gold looking. The shawl is knit in KnitPicks merino (storm) on the size needles specified in the pattern. She measures 80 inches across, 50 inches from edge to point, and 60 inches on the angle, which is bigger than the pattern specifies. The index and ring finger patterns call for decreases in the tip of each fingers, which is fine and expected. However, starting with 15 stitches on the needles, I was supposed to knit two together around, and end with 12 stitches. Truly knitting 2 together to complete the round would yield 8 stitches. Instead, I interspersed 3 K2T while knitting the rest of the stitches = 12 stitches at the end of the round. I then continued on with the decreases as specified. When I finished the left glove, the index finger and middle finger were too long. I wish I had taken a picture because the glove looked a little deformed. 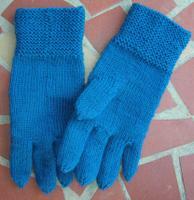 I frogged back the decreases at the end of each finger and three rows of regular knitting. I then knit the decreases to finish the finger (in effect, making these two fingers three rows shorter than the pattern specifies). The other two fingers and thumb were fine as designed. I had some trouble with the directions for the right hand glove. The only described difference in the right and left gloves is the placement of the thumb (which was fine). The instructions are to knit the other fingers as for left hand (placing them in the correct order for the right hand). In order to make this work, I joined the yarn at the base of each finger on the back of the hand instead of on the palm, as described for the left hand. I had to come back and stitch closed a few holes at the bases of the fingers. Maybe with the next pair I will be able to avoid these holes. I also noticed something that looks like a seam in the garter stitch cuff where I changed from purl to knit and back again. Springy seems to be having the same problem. What a nice pair of gloves! I love the simplicity of the design with the garter rows on the wrist- nice! It is good to know someone else had holes and a mock seamed cuff..I thought it was just me! I think your gloves turned out amazing and I just love that shade of blue!